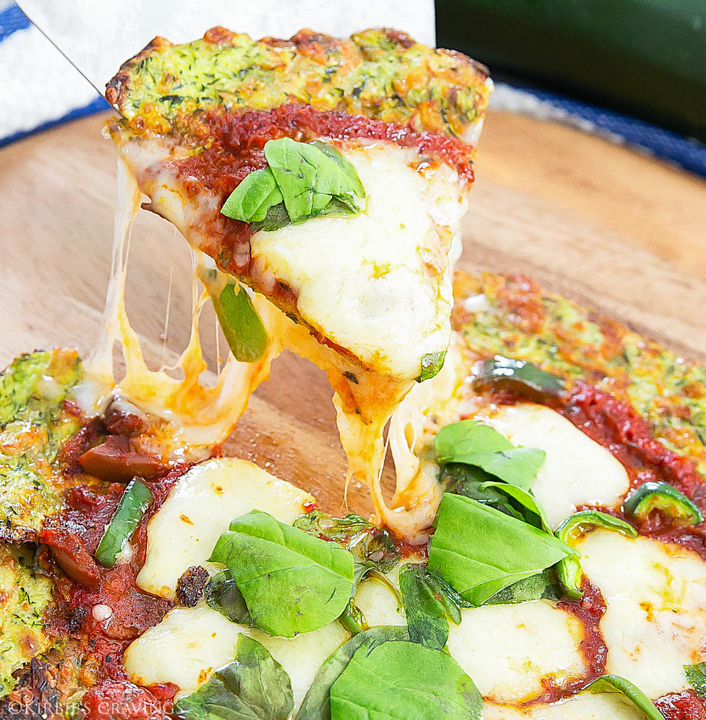 This low carb zucchini crust pizza is crispy, delicious and a great way to add more vegetables to your diet. Next to cauliflower, the vegetable I’ve enjoyed experimenting with most is zucchini. I already previously made a successful cauliflower pizza crust which my husband loves, so I thought, why not zucchini? 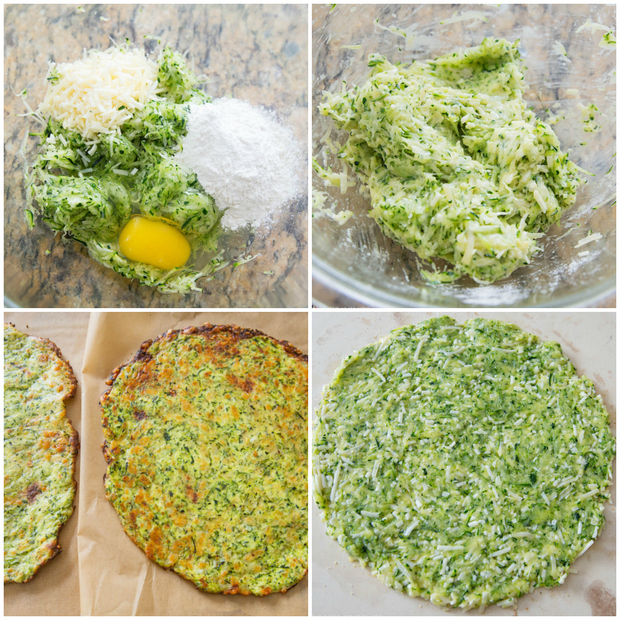 With summer just around the corner, I love how this crust manages to stay a bright green. 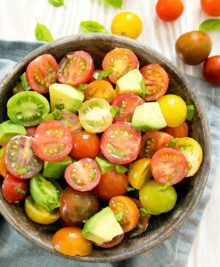 I can imagine added slices of tomatoes from my garden for a colorful garden pizza. The crust is loaded with zucchini, but it doesn’t really taste of it. It tastes very similar to the cauliflower crust pizza I previously shared. Slightly crispy, chewy and more like a flatbread crust rather than a crust made of vegetables. I’ll definitely be making this one again! Preheat oven to 450°F. Line a large baking sheet with parchment paper. Add zucchini to a large bowl and let sit 10-15 minutes. Drain excess water from zucchini bowl. Using a cheesecloth or several sturdy paper towels, add in 1/2 cup of zucchini into towel and wring dry. Repeat with remaining zucchini. When you are finished, you should have about 1 cup of zucchini remaining. Add zucchini, egg, cheese, pepper and flour to a large mixing bowl. Mix until all ingredients are thoroughly combined. Dump zucchini mixture onto baking sheet lined with parchment paper. Using a spatula, thin and spread out the batter so that it forms a round crust approximately 9 inches in diameter and 1/8 inch thick. Bake in oven about 15-20 minutes or until edges are golden brown and both sides are cooked. Flip over crust and bake an additional 10 minutes until top is crispy. Flip pizza crust back over. Lower oven temperature to 400°F. 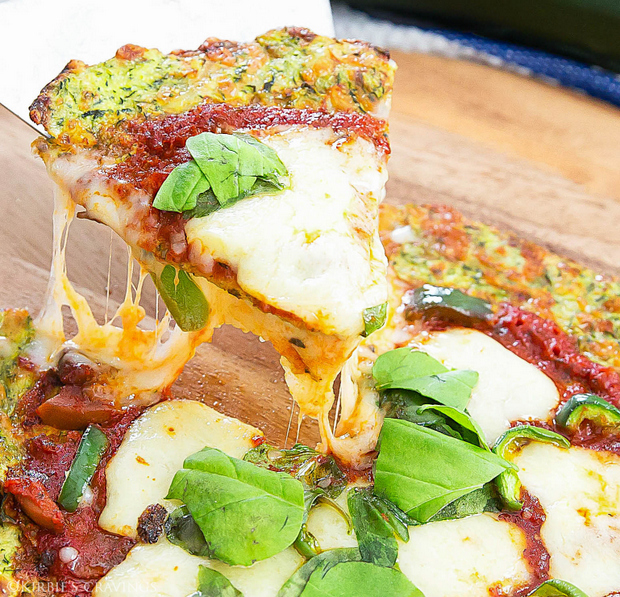 Add whatever pizza ingredients you desire to your crust. I did a layer of marinara sauce, followed by fresh slices of mozzarella, sliced bell peppers and fresh basil leaves. Bake for about 8-10 minutes or until cheese is melted. Serve immediately. I use these cheesecloths* to wring dry the zucchini. Wow, this is great recipe and so easy too. I’ve been on a zucchini kick lately (usually sautéing or making into zucchini noodles) so this will change things up. I made this to use up a bunch of frozen zucchini I had and it is AMAZING! With frozen, the dough was a bit wetter than your pictures, but an extra tablespoon of flour brought everything together. Delicious, easy to make and a great way to get in an extra serving of vegetables! Thanks! so glad you like it! I love that it tastes like a crust and not just mashed up zucchini. 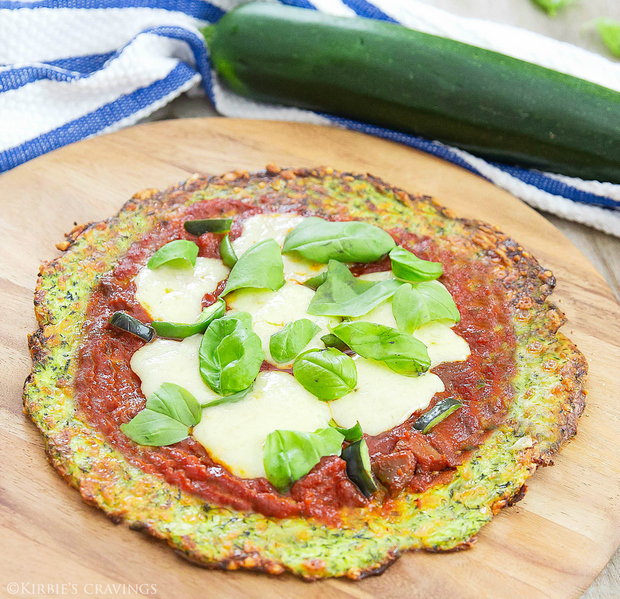 such a fun low carb pizza crust! 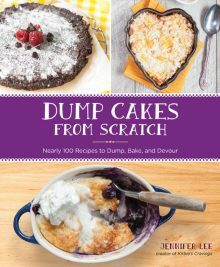 it’s a great low-carb alternative! yes, I think it should work with many other types of cheese. perhaps try cheddar? do you know if you can freeze these crusts after you cook them? I haven’t tried it, but I think it should work. I tried you crust using Pepper Jack cheese instead of Parmesan and I ran the zucchini through the juicer the way I do with the cauliflower and broccoli, to remove the liquid. It leaves the vegetable grain size and removes the liquid… No paper towel or dish towel needed. It came out great! Thanks for the recipe. I used the liquid from the zucchini in my green morning smoothies. I made this last night for dinner and it was so yummy! The crust was nice and crisp, way better than cauliflower pizza crust which usually turns out kind of soggy for me. I’m making it again for lunch today. Thanks for the great recipe! Would a gluten free floor like almond flour also work? I must have done something wrong. Flavor was good, but it was a soggy mess, and yes, I had the zucchini drain and squeezed it out. Hmm, I’m not sure. It sounds like either too much zucchini or the zucchini needed to be squeezed even more. Did you add the flour? Because that should absorb any other water the zucchini releases after it’s been squeezed. What temperature do you bake the crust at? 450F. It’s listed in the first direction step. How many does this feed? I didn’t see the serving sizes in the recipe. Thanks! This was awesome! My kids even LOVED it!! Thank you! wow, that is so great to hear! So happy your family enjoyed this! I made this for dinner and it was amazing! I’m going to make more and freeze them for quick future dinners! I never leave reviews but I can’t get over how perfect it turned out. Thank you!! Wow, thank you so much for taking the time to leave a review! It means a lot to me, especially since you rarely do so. 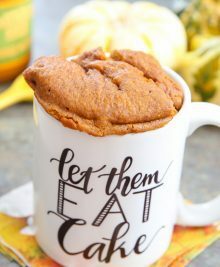 So glad you are enjoying this recipe! I’m vegan – what would be a good replacement for the egg? I usually sub flax seed, not sure if it is the right replacement for this application. Thanks! Can I use coconut flour or almond flour instead of regular flour, to make it a real low carb crust. yes you can sub with almond flour. Hello. I haven’t eaten pizza in a while and it looks like a great recipe. But can i use white whole wheat or oat flour?